A quality butcher experience can look expensive at first glance, but if you plan your ratios of meat to other ingredients, careful meal planning and a little thought can have us all producing great quality meals from great tasting ingredients – yet still coming within budget. I’ve been using products from the Fresh Food Guru since their first days online, when they were known as Andrew Gordon Butchery. I love the service, and having meat delivered to my door. The new online branding, has a fresh and modern appeal that lovers of good food will appreciate. I’m really pleased to offer this giveaway from my favourite butcher, for readers on the UK Mainland. One of you is going to sit down, with your family, to a fabulous White Christmas Dinner Pack from the Fresh Food Guru. The full pack is worth £85, but is available online at a discount rate of £76.00. 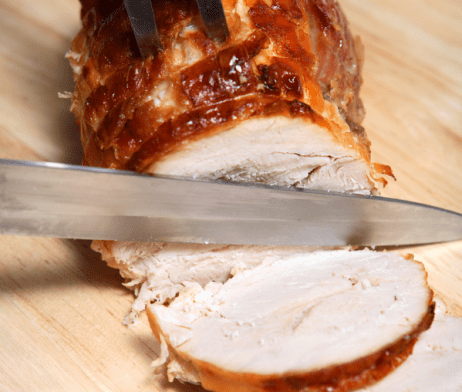 Boneless Turkey Breast Roasts are all pure white turkey breast meat. The Traditional Oatmeal Stuffing is made with 50% less salt. The Pigs In Blankets are made by hand and come wrapped in dry cured Scottish Streaky Bacon. It’s perfect for crisping while your turkey is roasting. The Lean Pork Sausage Meat comes from a decades old trusted recipe, using the finest pork rump, shoulder and leg cuts. Pork Chipolatas are hand-made on the premises, and made from lean and meaty pork. 15% off all online orders this Friday, 28th November, so if you fancy something tasty, give them a try. Simply enter this code into the shopping basket. The code cannot be used in conjunction with any other online discount code. Subscribing to the Fresh Food Guru newsletter is mandatory for this giveaway, however if you already subscribe, then please sign in or use the same e-mail address to enter this giveaway, so that we can match you up if you win. Closes 15th Dec 2014 at midnight. The Rules – Open to UK Mainland Entrants only. – 1 Winner will win one White Christmas Dinner Pack from the Fresh Food Guru. – The prize will be sent to you from freshfoodguru.co.uk, and posted from within the UK. – Winners will be notified within 2 days of giveaway end. If the winner does not respond within 3 days, a new winner will be drawn. – The winners will be chosen by Rafflecopter random generator. – Scottish Mum Blog or Fresh Food Guru reserves the right to amend, add or withdraw this giveaway at any time. – Each entry method entitles you to one entry into the draw. Daily retweets count if you re-enter the widget and put the tweet url in. – Closes 15th December at midnight. I love a lamb roast! Homemade meatloaf with creamy mashed Tatties and veg. my fav food is yorkshire pudding, with roast potatoes, mashed potatoes soggy sprouts and thick gravy, the meat i vary, the rest is set in gold! It would have to be a roast chicken dinner with all the trimmings….sooooo yummy!!!! I like egg and chips or egg on toast. I just love eggs! I just like a beef sunday lunch. A good roast rib of beef, not that we have it very often. Roast beef and Yorkshire puddings with swede, and mashed and post potatoes with mint sauce……….I am starving now just thinking about it! Lasagne – the way I cook it! Fillet steak with a peppercorn sauce. Big lover of mexican food! A roast dinner with lots of gravy! Cake 🙁 hence why I just rejoined weight watchers!!! Anything veggie for me,but hubby meat. I make a scrummy cheesecake! I love a roast with lots of gravy. Yum! Brussell Sprouts – I am a bit weird! Pizza, major pizza cravings right now! That is such a hard question to answer as I love food!!! But I think it has to be a traditional roast beef with all the trimmings and some good firey horseraddish!!!! Gosh! What a difficult question. It varies according to the time and the season! In this weather I’m loving casseroles and jacket potatoes! Chocolate, but chicken is my favorite meat. My favourite food has to be bacon sandwiches. Believe it or not it’s mince and tatties!!! Mushrooms. Any and all different ways. Thai. Pretty much anything as long as it’s Thai. steak with stilton sauce. yum. It changes from day to day, but today it’s Black Forest Gateau. A roast chicken sunday dinner or in fact almost anything with chicken, its so versatile. Oh and cooked cheese! I love turkey and stuffing at Christmas. I love so many foods but my ultimate comfort food has to be chips! I seem to go in fads of what I like. At the moment its beans on toast, yum yum. Difficult question, if pushed, I’d say steak and chips! honey glazed gammon with Mashed Potato…. It has to be a good roast chicken with all the trimmings. favourite food – anything from the sea, especially prawns! Not sure I can narrow down my favourite food to just one! Will shellfish do? Or if pushed scallops.